The trend of Hindi film music started changing in sixties and one of the legendary music direct ors, Anil Biswas left the music industry to finally settle down in Delhi. Initially, when the compilation of Hindi film songs was started way back in 1968-69, it was decided to compile such information upto 1970 only due to deteriorating quality of Hindi film music. Again, it was Maestro Anil Biswas who released Volume-IV of Hindi Film Geet Kosh. The release function was organised at AIFACS Auditorium in New Delhi on 7th July 1986 to coincide with the 73rd birthday of the maestro himself. On 7th July 1896, the moving pictures were shown for the first time at Watson Hotel, Bombay and thus, films had completed 90 years on this day. Asa Singh Mastana, Mrs. Nirmala Husnlal (wife of maestroHusnlal), Meena Kapur, Mrs.Bina Chopra (Daughter of K.L.Saigal), Mr.P.D.Mathur (Brother of Mukesh) also graced the function. Details of about 7,000 songs of 1,007 Hindi (and its dialects) films censored between 1961 and 1970 have been given in 668 pages of this Volume. 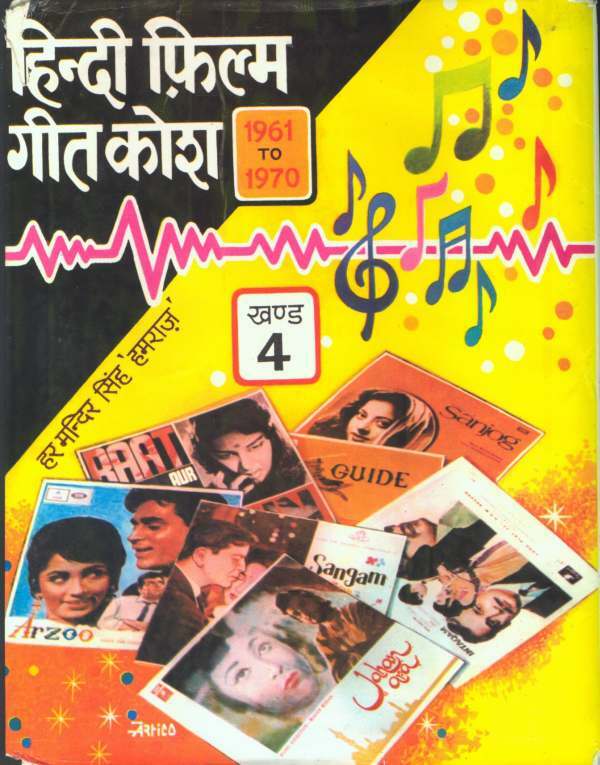 This volume happened to be the third in the series of Hindi Film Geet Kosh released in 1986. All the stock of this volume has since been sold out and its xerox edition is being provided to the music lovers on demand. Sample page is appended.